Preheat oven to 350°. In large saucepot, heat oil over medium-high heat. Add chiles, onion and bell pepper, and cook 5 to 7 minutes or until vegetables are almost tender, stirring occasionally. Reduce heat to medium. Stir in beans, chicken, lime juice and cumin, and cook 8 to 10 minutes or until heated through, stirring occasionally. Remove saucepot from heat; fold in cheese and cilantro. Spray rimmed baking pan with nonstick cooking spray. Evenly spoon about 1-1/4 cups chicken mixture down center of each tortilla; fold sides over filling. Place burritos seam side down in prepared pan. Bake 15 to 20 minutes or until tops of burritos are lightly browned. 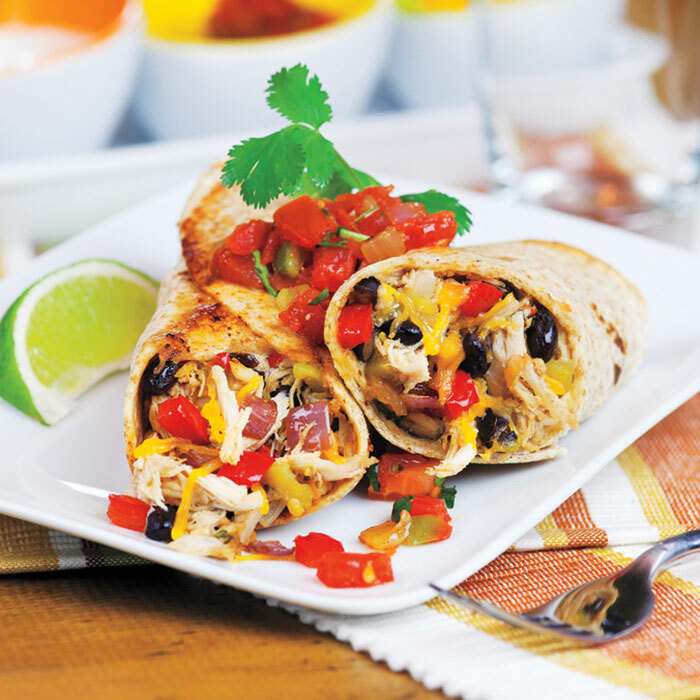 To serve, top each burrito with 1 tablespoon salsa and garnish with cilantro sprigs, if desired.